Get well soon card featuring Guzzler the greedy little pig. He eats everything he can get his snout into. He stuffs himself with all the other animals food including the farmer's breakfast and even eats the washing on the line. The farmer's wife is not impressed and so to teach him a lesson the farmers arranges for several lorry loads of rotten vegetables to be delivered. Guzzler can't resist and eats the lot which leaves him feeling very porrly and sorry for himself but has he learned his lesson? 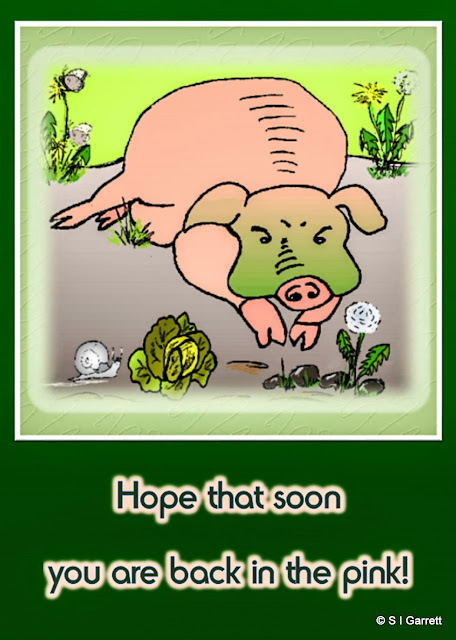 Here he features on a get Well Soon card.